This slim insulin pump band by Pouch For All is 7cm wide and is made using top quality lycra with a soft seam. It has a concealed pocket with popper that will stretch to securely hold your insulin pump and can be worn under or over your clothing. It is suitable for day wear, sport or at night time. If your size is shown as being on backorder it will take approximately 3 weeks to arrive. 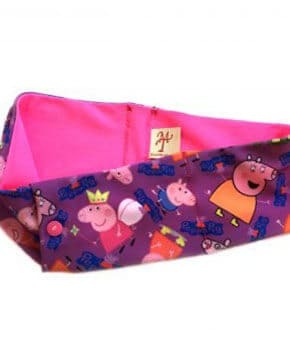 The Peppa Pig Insulin Pump Slim Waist Band width available in three length sizes. If your size is shown as being on backorder it will take approximately 3 weeks to arrive. All other in-stock orders are dispatched same day/next day and will arrive within 5 business days.